Working with Bison Panel is like working with any other particle board - fastening is done in the same way an any other board. No special tools are required. However, for large volumes of cutting work, an electric power saw is recommended. A power saw, 1500W - 4000 rpm with a blade of 250 mm diameter provided with straight set teeth & tungsten carbide tips is ideal for use. Similarly, a hand-held electric drill with high speed steel bits will be faster to work. Bison Panel can be fixed to timber or steel supports. Thin cold roll formed steel section in the form of studs & tracks are available in the market. 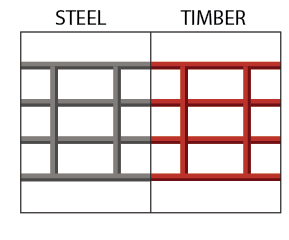 If timber studs are used, choose a well seasoned wooden section of 11/2" x 3" or 2" x 4". 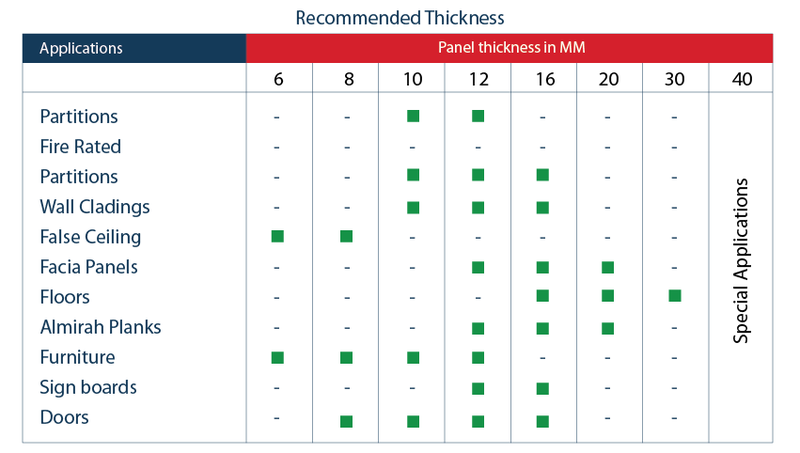 Rolled steel sections like C-Sections & U-Sections will be available in thickness 0.5 mm to 0.7 mm (galvanized). They can be used for interior work under controlled humidity conditions & can be used with advantage for applications like partitions, false ceilings, floors, etc. The boards must be supported on all four edges & at intermediate positions at centres not exceeding 610 mm. The board joints should occur on the centre supports. Rust proof fixings should be used for all external applications or when conditions of high humidity or dampness are expected. Bison Panel, upto 8mm thick, can be nailed directly to timber supports with round wire nails. 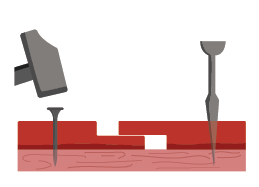 For boards over 8mm thick, a pilot hole of 0.8 times the nail diameter must be predrilled. The nail length should be approximately 3 times the thickness of the board. 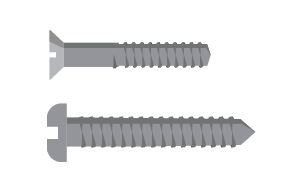 Three types of screws will be available in the market - Wood screws, Metal screws, & Self tapping screws. Wood screws are used for fixing Bison Panel to wooden supports. A prehole of 1.2 times the diameter of the screw shank shall be provided in the panel before screwing. In case, countersinking of head is necessary, slightly oversize hole can be drilled to required depth. The length of the screws shall be 2.5 to 3 times the thickness of the board. 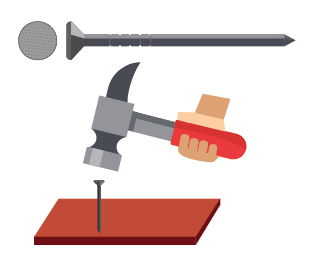 Regarding metal screws, fully threaded self-tapping type screws must be preferred. The size of the screws will be according to thickness of the board & the guage of framing. Predrilling of the board to 1.2 times diameter of shank is a must. The length of the screws shall be 2 to 2 1/2 times the thickness of the board. 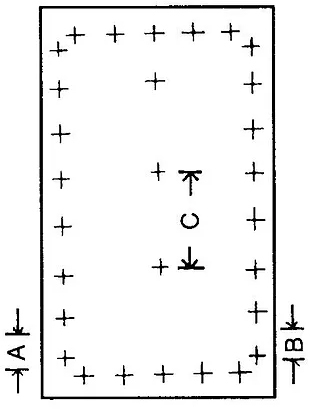 The recommended fixing distance between two fixing points around the perimeter is 200 to 300mm. The fixing distance between two fixing points in the intermediate support is 300 to 600 mm. The fixing points has to be 15 mm (minimum) to 30 mm away from the edge of the board. Similarly, the fixing point shall be 40 mm to 75 mm away from the corner of the board. 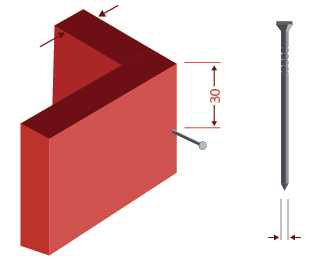 Whenever screws are to be driven through the thickness of the board, the following points shall be noted. 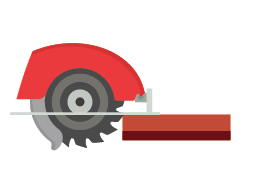 Side screwing is not recommended for boards of 12 mm and below thickness. Screwing shall be done in the centre line of the thickness. Bison Panel is subject to slight dimensional changes due to variations in temperatures & relative humidity of air. Provision should be made in the joint by allowing a gap of 2 to 3 mm. The gaps can be left as seams or sealed with cover strips as the case may be. These cover strips could be PVC, Aluminium, or wood 'T' type profiles that are fixed in the gap by either screwing them or fixing with a synthetic adhesive. Bison Panel has an alkalinity pH value 11 to 13. So alkaline resistant glues or adhesives are to be used for binding the panel. Please refer to adhesive manufacturer’s specifications. Bison Panel can be coated with any kind of paint including distempers, Acrylic resins, Acrylic emulsions, Epoxy systems, Polyurethanes and most other alkali resistant Paints. The board has to be given a primer coat with cement primer / wood primer before applying decorative paints. All kinds of boards will show a tendency to warp when exposed to unequal conditions, i.e. when one face is effectively sealed and the other face is left free. To avoid this, the other face must also be treated with a coating of equivalent effect in order to balance the board against warping. Painting should be done when the board is completely dry and atmospheric humidity is dry. Whenever the board is subjected to different humidity conditions, the absorption or release of moisture in the board is very slow. Hence a minimum of 48 hours will have to be allowed to attain moisture equilibrium in the board. Painting is not recommended when the moisture in the board is more than 12%, particularly in case of impermeable paints. Bison Panel can be used for cold pressing or low temperature laminating. The surface of the board can take wood veneer, PVC, foils, melamine laminate and paper over lay etc. Prior to lamination, the board should be acclimatised for atleast 48 hours before providing decorative laminates. It should always be balanced by applying a compensating laminate on the other side. To control absorption of adhesive, the surface of the board may need to be primed with a dilution of the adhesive. Prelaminated Bison Panels are manufactured by NCL under the brand name BisonLam. They are available in thickness ranging from 6 mm to 16mm. They are available in popular shades like Natural Teak, Sea Beach, Ivory and white. For more details, see the product range section & contact us. 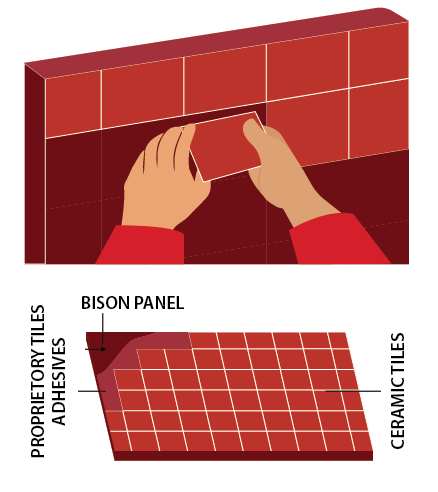 Ceramic tiles can be fixed to Bison Panels with alkali resistant elastic tile adhesive. 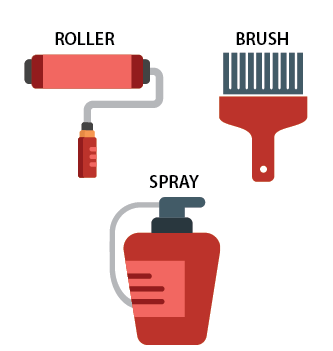 Refer to the tile adhesive manufacturer’s specifications. The tile joints will have to be provided with an alround gap of 2 mm and the gaps should be filled with an elastic sealent. HANDLING : Carry the Panel vertically as the Panel may break due to sag and swing if carried horizontally. Do not lift the board when it is wet. STORING : Stack the boards flat on a level ground or on level supports to avoid bending ofthe boards due to self-weight. EDGE SUPPORTS : While fixing the board on a frame work all the edges of the board are to be fully supported. Unsupported edges may chip off. 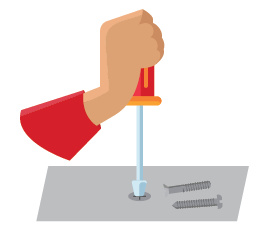 NAILING/SCREWING : Drill a Prehole 0.8 times Dia before Nailing or 1.2 times in dia before Screwing to avoid local cracks. 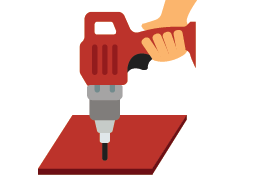 EDGE SCREWING : Screwing through the thickness ofthe board is not recommended for Boards less than 12 mm thick. FIXING : Fix the Panels on flat frame. Do not fix on curved surfaces like pipes. PAINTING : Bison Panel can be painted with variety of paints over a thick coat of cement primer/wood primer. Painting should not be done when the board is in wet condition. BALANCING : When one side of the board is painted or laminated, the other side also requires painting / lamination to arrest warping in the board. JOINTS : When ever the boards are fixed on the frame, a gap of 3 to 5 mm will have to be provided between board joints to take care ofthe movement in the board due to atmosphere changes in humidity.